As is true with the other books in the Pushing the Limits series, Take Me On follows similar themes of self-discovery, surviving/overcoming harsh circumstances, exorcising personal demons, and first love. While I did enjoy this novel, for some reason Take Me On failed to grab me completely like the previous PTL books did. I love Echo & Noah, Beth & Ryan, and Rachel & Isaiah, but I had trouble connecting with Haley & West. I found Haley to be a little on the bland side, and West leans too much the way of the stereotypical-bad-boy-with-a-good-heart-who-is-bit-of-a-walking-innuendo. (Yes. It’s an official classification of romance hero.) 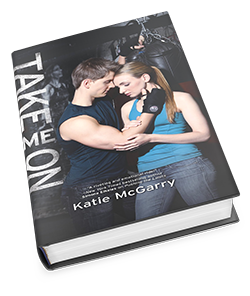 But nevertheless, despite my issues with the characters, it was still an enjoyable read full of the drama, romance, tension, danger, angst, and redemption that I’ve come to expect from a Katie McGarry novel. P.S. – Also, I have to add that my favorite bits of Take Me On are the ones that include Abby. She’s such a GREAT character. Intellectually, I know that Julie Kagawa will never disappoint me. I’m aware that her writing never stops impressing me and that her ability to take my heart, smash it, and put it back together is something nearly breathtaking in its complexity. Yet despite this knowledge, I am somehow always left in awe. Every. Single. Time. This woman is a genius. 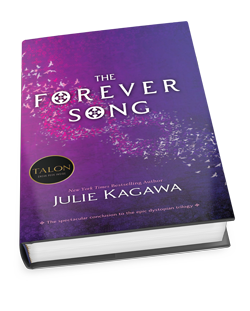 Overall, The Forever Song is fitting conclusion to an epic tale of love, sacrifice, and the pursuit of humanity in the midst of psychotic monsters. Absolutely fabulous read!